One in four people suffer from a mental or emotional disability and many of them get incredible comfort from their family pet. Emotional Support Animals are given limited rights to provide their owners with companionship and affection. Those rights include Air Travel and Housing Accommodations. Unlike most types of assistance animals, such as Service Dogs, ESAs are not required to have any kind of specialized training or experience. This presents a HUGE ethical issue and sadly, many people are taking advantage of the laws. The Exceptional Sidekick believes that all animals that are entering public areas be trained to the highest standards and above all else are safe and comfortable in all environments. There are very few pets that would not be stressed walking through security at an airport or riding on a plane. That is why we believe that Emotional Support Animals should be trained to the same high standards of a Service Dog. At minimum an ESA should be able to pass an AKC Canine Good Citizen Test and a Service Dog Public Access Test. 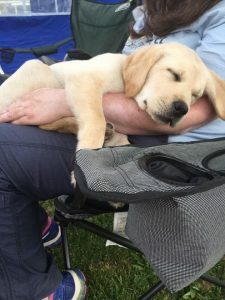 We also believe that an Emotional Support Animal that is trained and able to pass those basic tests should further their training to include a few tasks which would then make their dog a service animal that could help their handler in far more situations. Now a note about the ethical dilemma surrounding Emotional Support Animals. There are many people that are taking dangerous, stressed, under socialized, and fearful dogs onto planes for their own selfish reasons. Not only is this extremely dangerous to the other passengers on the plane but it is also highly unethical. When dogs are forced into situations that they are not comfortable in they are far more likely to bite, overheat, lose control of their bowels, or completely shut down from extreme fear. 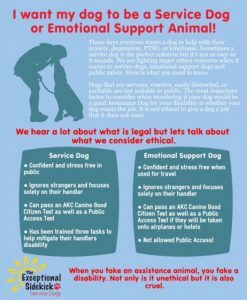 With Service Dogs, the animals well being always precedes the handlers but with ESAs owners are putting their needs above the dogs and it is not fair. In addition to our concerns with the dogs well being we would also like to point out that most airlines have a limit to the amount of dogs on a plane. With so many people traveling with their small pets, EMAs, and Service Dogs, there are now times that Service Dogs are not allowed on a flight because there are so many other animals on the plane. For someone that can not travel without their Service Dog it presents a huge problem. People with Service Dogs often travel for work and if they are restricted from flying they are unable to perform their job. If you are thinking of traveling with an Emotional Support Animal please consider your dog’s temperament, comfort level, ability to handle stress, and whether you are able to comfortably fly without your dog. Having a fake ESA is the same as having a handicap sticker on your car just so you don’t have to walk as far. If you wouldn’t fake being handicapped then please don’t fake needing an ESA or Service Dog.